Nicole is the daughter of the first patient met by Professor Bousser. In memory of her father, she has mobilized volunteers to his family and his entourage who helped create the association whose original name was ACF (Cerebral Arterial Family) France. More details about the creation in the french version : HERE. CADASIL was discovered in a French family. In 1976, a man was hit by a cerebral attack. He was examined in an hospital in Paris, where a neurologist, Mrs BOUSSER, determined that his TIAs had no usual reasons and that he presented no vascular risk factor. Scanner images showed that he had already suffered several small brain infarcts. A few years after, his daughter had also some neurological problems; she came in the same department and the scanner investigations showed the same kind of brain disorders. After discussing on the history of their family, mostly living in the west of France, Mrs BOUSSER decided to launch a research program, guessing it was an unknown disease, with probably a genetic origin; she had already heard about other families presenting the same kind of health disorders. 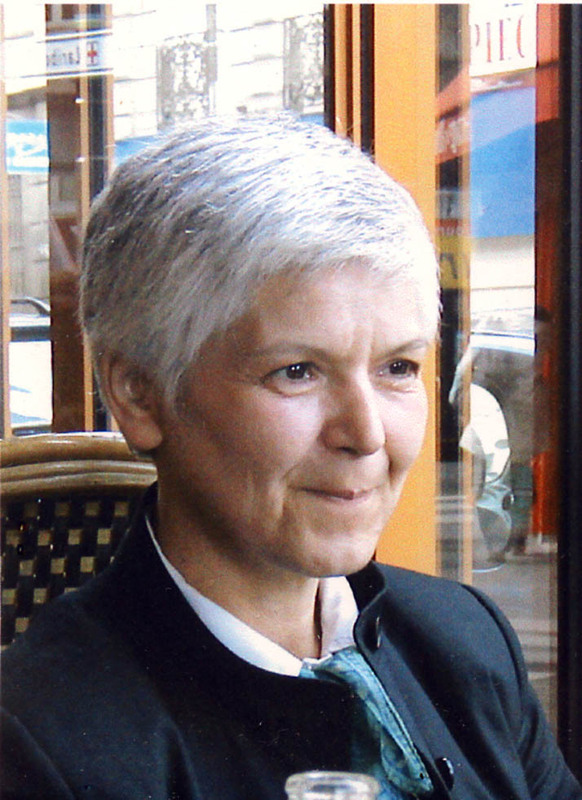 A Professor in biology, Elisabeth TOURNIER-LASSERVE, got involved in this program. They showed the illness had an autosomal dominant transmission way and they gave a name to it: CADASIL. This discovery was announced during international medical conferences and in medical publications. Many members of this family accepted to participate in the research program (clinical, genetics and MRI exams) and they had several opportunities to have contacts with Professors BOUSSER and TOURNIER-LASSERVE who shared with them their hypotheses and results. Thanks to the participation of this family, the NOTCH3 gene was identified in 1995. As this family had developed a good communication with the medical team, some cousins organized a conference during which medical staff shared his knowledge with members of this family, and other patients that had been informed by Mrs BOUSSER. When the first person having been diagnosed with CADASIL died, his daughter made a pledge to create a CADASIL association. 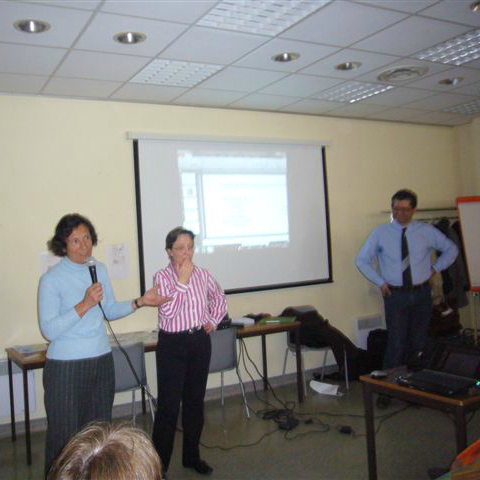 Another meeting was organized in the Paris hospital where Mrs BOUSSER was in charge of a neurological department and where she directed the CADASIL research, which was conducted by Professor CHABRIAT. They had informed several other families concerned by this new disease. This is how it was decided to create the CADASIL France foundation in 1999. It has about 150 members. We are lucky that Professor CHABRIAT and the psychologist in Mrs BOUSSER’department take part in the administration committee of our association. This committee has a quarterly meeting. We administrate a website (www.cadasil.com), send an information newsletter to our members each term, organize medical discussions during our annual meeting. During some of these annual meetings, we organized on several times a group of discussion between adults, and other discussions for youngsters, who live with parents suffering of CADASIL and having a 50% risk for themselves. We organize also some events, like classical music concerts, or participate in a rare diseases March across Paris each year during the French Telethon, etc. 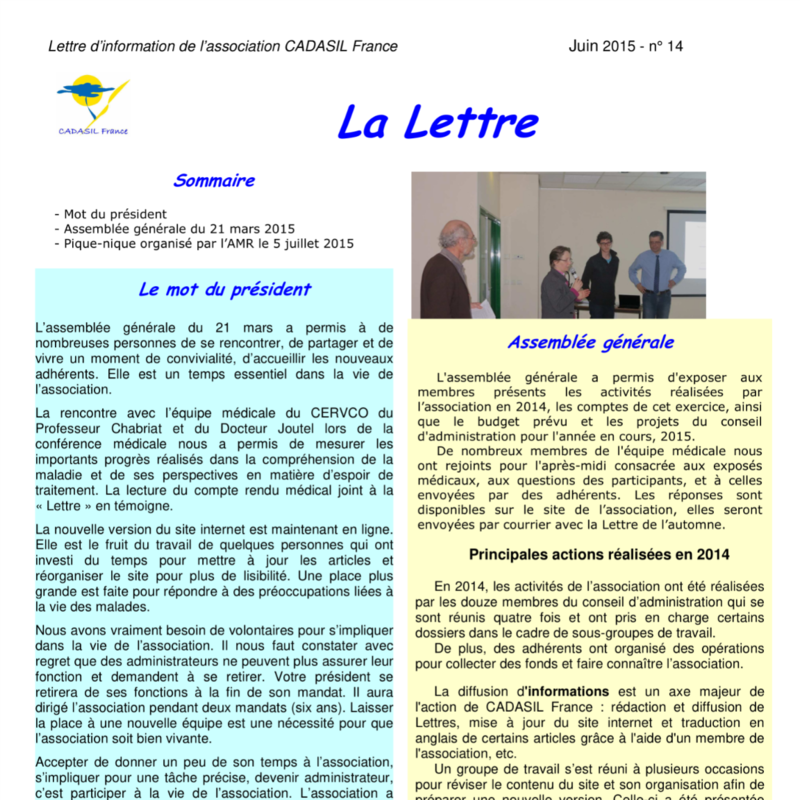 We have also a leaflet that was sent to all neurologists in France. We also try to help the medical team to get the participation of volunteers in their research programs. CADASIL France is affiliated to two federations of rare diseases associations in our country.